Our House Framing has finally started! After months of cutting through red tape with the city and HOA, and fighting rainy weather, the day has finally come. As with the Slab, it is amazing what these guys can do so quickly. Yesterday they received the materials and started snapping chalk lines, and today, this is where they are. So the photos below are just after two days of framing. It is finally nice to start seeing what the house will actually look like when it is not on a sheet of paper with a bunch of boxes with dimensions on them. It is so hard to visualize what the house will actually be like until they actually started the house framing. Now you can see rooms emerging and can see how big they will be. You can also get a good feel of the outdoor space and its size with the house framing in place. We went by today and they had finished most of the interior walls and had started on the ceilings. This is an exciting time in our household. It will not be too long now! 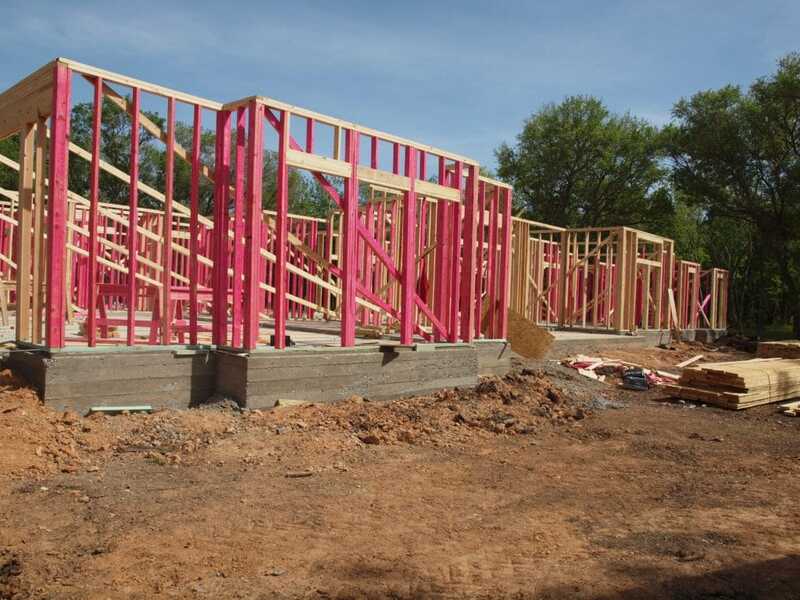 Stay tuned for an update and more pictures as we continue with the house framing and beyond! Now if those stumps in the back of the property would just disappear, everyone would be a lot happier. That will be our next project while the folks at Deason Construction, take care of this part! Front of New House Starting to Take Shape! Why did they have to put the dumpster there? Right in the way! Back Porch Starting to Look Like a Porch! This Little Guy Was Just Hanging Out!